Rockford Lodge stands on the sunny banks of the East Lyn river at Rockford in the beautiful Brendon Valley of Lorna Doone fame. Rockford Lodge sits in its own secluded gardens. There is also a separate adjoining hillside garden with a patio and summerhouse. The Rockford Inn is conveniantly located just the other side of the East Lyn river and welcomes families and dogs. Evening dining is very popular so booking is adviseable. ... a three bedroom cottage sleeping up to 6 people and located on the sunny bank of the picturesque East Lyn river in the lovely Brendon Valley of Lorna Doone fame. Situated on National Trust land of the beautiful Watersmeet Estate, Rockford Lodge is approached by a footbridge and is peacefully set in a woodland away from all traffic. The spectacular coast of North Devon is nearby with Lynton and Lynmouth just four miles away. From the garden gate river, moorland and coastal walks abound and the surrounding countryside is a delight for the naturalist, country lover and photographer. Salmon and trout fishing is available on the East Lyn and there is excellent riding nearby. Rockford Lodge is comfortably furnished with a master double bedroom and two further twin bedrooms. The living accomodation comprises sitting room, dining room with TV area and farmhouse kitchen. There is also an attractive beamed summer sitting room with beautful views of the East Lyn. 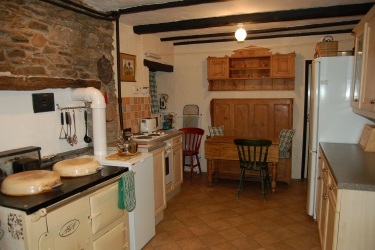 The cottage is centrally heated with an Aga in the kitchen which keeps the cottage beautifully warm during the cooler months. Free WiFi is also available. Rockford Lodge is ideally situated for exploring Exmoor. 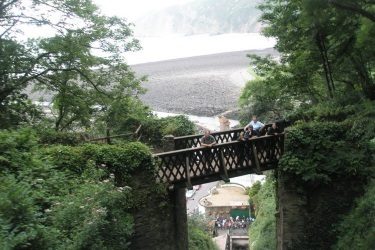 Whether you are planning a relaxing holiday, doing very little or a week or two of trekking the wonderful footpaths that Exmoor has to offer, there is plenty to keep everyone happy from the Lynton and Lynmouth Railway to the Exmoor Falconry and riding on Exmoor. We've provided a few links on our website, with details of some of the local attractions. 'This cottage is one of our all-time favourites, particularly for its location: it's a special pleasure to leave our car in the main part of the hamlet of Rockford (just a pub and a handful of cottages) and walk a few yards over a footbridge across the tumbling River East Lyn to see Rockford Lodge again and, sometimes, to meet the contented people staying in it.